As an open source community, FreeNAS® relies on the input and expertise of its users to help improve FreeNAS®. When you take some time to assist the community, your contributions benefit everyone who uses FreeNAS®. This section describes some areas of participation to get you started. It is by no means an exhaustive list. If you have an idea that you think would benefit the FreeNAS® community, bring it up on one of the resources mentioned in FreeNAS® Support Resources. FreeNAS® uses Pootle, an open source application, for managing the localization of the menu screens used by the FreeNAS® graphical administrative interface. Pootle makes it easy to find out the localization status of your native language and to translate the text for any menus that have not been localized yet. 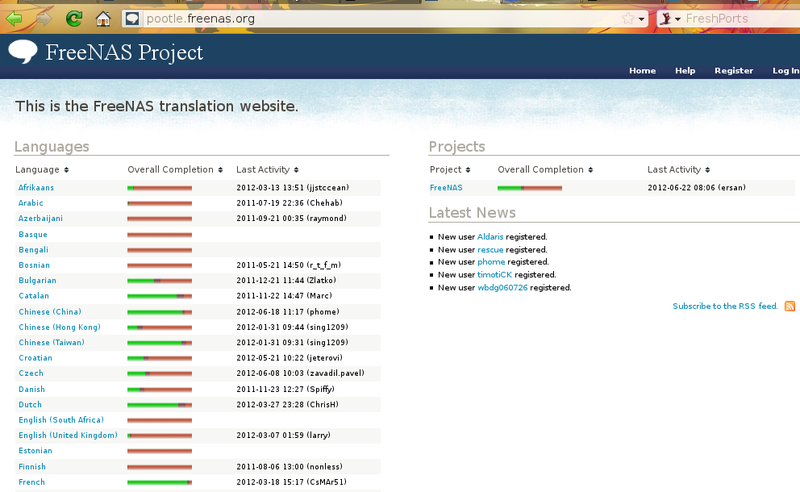 By providing a web editor and commenting system, Pootle allows translators to spend their time making and reviewing translations rather than learning how to use a translation submission tool. The localizations FreeNAS® users have requested are listed alphabetically on the left. If your language is missing and you would like to help in its translation, send an email to the translations mailing list so it can be added. The green bar in the Overall Completion column indicates the percentage of FreeNAS® menus that have been localized. If a language is not at 100%, it means that the menus that currently are not translated will appear in English instead of in that language. If you wish to help localize your language, you should first join the translations mailing list and introduce yourself and which language(s) you can assist with. This will allow you to meet other volunteers as well as keep abreast of any notices or updates that may effect the translations. You will also need to click on the “Register” link in order to create a Pootle login account. Simply type in the translated text and click the “Submit” button to save your change.